The most luxurious, glamorous and desirable ghd styler yet, the ghd Gold Mini Styler features smaller, contoured plates to give you more control and styling power than ever before. 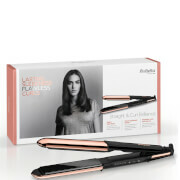 Curls, waves, flicks, and of course, super sleek straight hair is a cinch. Accents of gold glimmer beneath the perfect black coating of the ghd Gold Mini Styler, as the ghd technology allows you to do more with short hair and fringes than you ever imagined possible – who said beauty and brains don’t go hand in hand? In addition to the high gloss plates, the rounded barrel, lighter body, ceramic heaters and universal voltage all combine to help you and your ghd Gold Mini Styler achieve any style you desire. 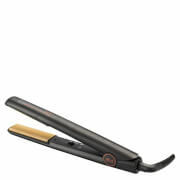 After styling slip your ghd Gold Mini Styler into the protective heat guard to leave you safe in the knowledge that your irons and your surfaces are safe after styling. Professional finish: luxurious plates smooth your hair for an ultra-shiny result. 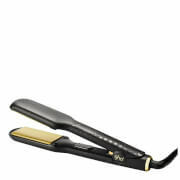 Smoother plates: the ghd golden plates have been contoured and given a high-gloss finish to glide through hair. Cooler, lighter body: with its improved outer body, the ghd Gold Mini Styler stays cooler to the touch for longer and is lighter to handle.